When the first entry in the new series of Star Trek films hit theaters in 2009, it was was a much-needed breath of fresh air. By simultaneously serving as a sequel, prequel and reboot to the franchise, it made Trek ready for a new start. No longer shackled by 40-plus years of muddled mythology, this brand new series was ready to venture out into the unknown. Ready to bring us stories that no man had seen before. The release of Star Trek Into Darkness in 2013 should have been a bold, new step in a bold, new direction. Instead, it was a mishmash of wasted potential and unrealized ideas. The idea of a renegade and militant arm of Starfleet is a good one. Devious Admirals and back-alley politicians have always been part of the franchise. However, instead of re-imagining one of these characters, or even properly utilizing the new character introduced for this purpose (Peter Weller’s Admiral Marcus — someone who was never seen in the old canon, but due to his relationship to a classic-series character, was a natural choice), the writers chose, seemingly arbitrarily, Khan Noonien Singh. Many of the film’s structural problems begin and end with this choice. Khan, in his original incarnation, is a genetically enhanced dictator from the 20th century, who was rescued from suspended animation by the Enterprise crew in the episode, Space Seed. After a tense standoff, Khan and his followers are eventually settled on a remote planet, that, after a time, undergoes an ecological disaster and claims the lives of most of Khan’s colony, including his wife. The path to vengeance was chronicled in the classic documentary, The Wrath of Khan. So, naturally, this storied character’s history made him a perfect choice to be involved in a story about the dark corners of Starfleet… except that it doesn’t do that at all. Into Darkness tries to tell two stories. One about militant renegades in Starfleet, and another about the persecuted Khan, and meshing those two stories together just doesn’t work. In fact, the film has to come to a dead stop, about 45 minutes in, so that Khan can deliver a monologue explaining just how the hell it is a frozen madman from the 20th century can even be involved. The renegade branch of the military storyline was more than enough to carry this film, and could have worked with any number of classic (or new) characters. Khan was shoehorned into the film simply off name recognition so the writers could tell a new, truncated version of The Wrath of Khan. It comes across as if they did not trust the story they had written to stand on its own merits. Had they trusted their original story about an officer gone made (a la Heart of Darkness — I imagine this is also where the film got the title), I believe that it would have worked exponentially better. To be honest, I could keep going about smaller nitpicky elements of the movie (Why do they have starships now that they have transporters that can beam to other homeworlds?) all day long, but all this was to basically say that Star Trek Into Darkness had the potential to tell any story they wanted. To be brave. To be different. To really take advantage of this new universe, where truly anything could happen. Instead, they tried to remake Wrath of Khan. I hate it because it frustrates me. Because there is a really good movie in there somewhere, but the filmmakers just couldn’t dig it out. This leads into why I am so excited for Star Trek Beyond. It looks bold. It looks different. The previews haven’t looked great, but they have given the sense that this is a story we haven’t quite seen for these characters before. There are new aliens! I know that it is hard to be original when there is 50 years worth of material behind you, but by God, they are trying. Also, Justin Lin is a terrific director. He has received some criticism because of his past work on the Fast and the Furious franchise, but you know what? That is a series of movies that understands family and knows how to give every character a moment to shine. Star and writer Simon Pegg even addressed some of the lingering technological questions from Star Trek Into Darkness (Is death cured now?). In grand Star Trek tradition, if there was technology that was invented last week that could solve all of our problems in the future, the writers would just ignore it. It makes for lousy consistency, but the idea makes me laugh. 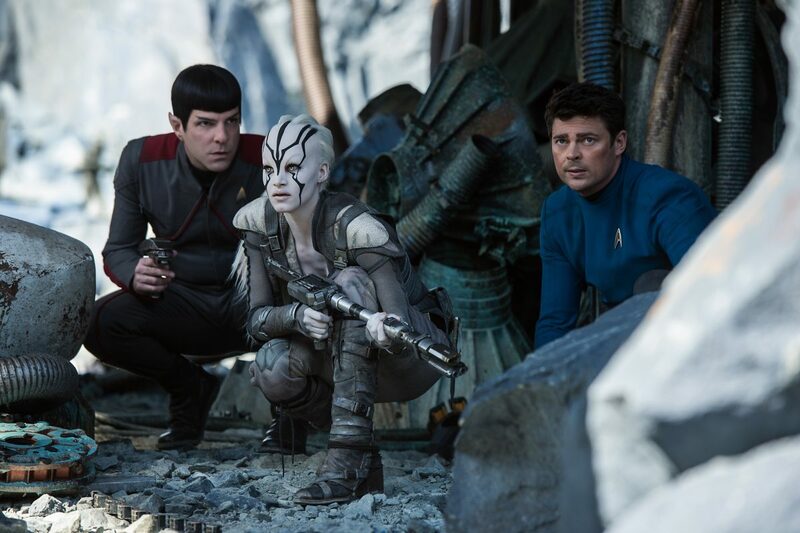 Even if Star Trek Beyond isn’t good, it is doing something that Wrath of… (this isn’t an intentional joke, I actually started typing Wrath of Khan), I mean Into Darkness didn’t even try to do. They are exploring strange new worlds, seeking out new life and new civilizations, and boldly going where no man has gone before. Shaun Andrews is an all-around fanboy who has been irrevocably damaged since watching both Full Metal Jacket and Lethal Weapon 2 on the same night at the tender age of 6. He studied Radio / TV Production at MTSU and now puts those skills to use playing video games and bitching about stuff on the Internet.